The Millennium is a study of not only fascination but of importance for understanding eschatology. All three futurist views of the end times either claim that the Christian age is the Millennium (Amillennialism and Postmillennialism) or, the Millennium will be established at the Second Coming of Christ, at the end of the Christian age (Dispensationalism). Whichever view one considers, the coming of the Lord is invariably posted as future in all three views. I should note that there is another view that says that the Millennium began in AD 70 at the end of the Old Covenant age, and will consummated at Christ’s literal coming at some time in the future, i.e. at the so-called end of time. For instance, in my formal debate with noted author and commentator James Jordan (2003) he argued that the Millennium began in AD 70. DVDs of that debate are available from me. For more on the Millennium, be sure to read my articles on “The Passing of Creation and the End of the Millennium,” found on this site. Here is a link to the first in the series. Now, while opponents of Covenant Eschatology like to claim that the AD 70 judgment was virtually insignificant, Jesus’ words belie that claim. How comprehensive would that judgment be? It would span from Jesus’ generation all the way back to Creation! How “inclusive” would that judgment be? It would be the vindication of all the blood of all the martyrs all the way back to Creation! Who would that judgment include? It would be the judgment of the living and the dead! To suggest then, that AD 70 was a strictly local, virtually insignificant judgment on just the Jews flies in the face of Jesus’ emphatic words. 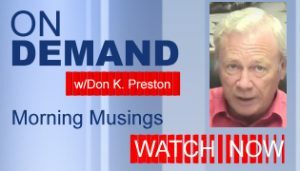 As I discuss in my book, The Resurrection of Daniel 12, Future or Fulfilled? the motif and theme of martyr vindication is one of the key components of a proper understanding of resurrection and the entire subject of eschatology. That theme runs– as Jesus’ words indicate– from Genesis through Revelation. To ignore this is to all but ensure a misunderstanding of Biblical eschatology. 1. The cry of the martyrs for vindication, God’s response to their prayer. 2. We must examine the language used to describe The Great Day of the Lord’s Wrath. Let’s look at the first tenet that calls for attention, the motif of martyr vindication found in the fifth seal. There, we find the depiction of those who had been slain for their faith. This calls to mind the great roll call of faith of Hebrews 11, those who were tortured, mocked, scourged and slain for their faith in the Lord. It most assuredly recalls Matthew 23. The reader needs to understand that, as noted above, the theme of martyr vindication runs from Genesis all the way through Revelation. It is, in fact, one of the fundamental keys for understanding Biblical eschatology, and yet, this topic very often gets “second billing” to concepts like the resurrection. The problem with that is that in Hebraic thought, vindication was resurrection! “Rejoice, O Gentiles, with His people; For He will avenge the blood of His servants, And render vengeance to His adversaries; He will provide atonement for His land and His people” (Deuteronomy 32:43). What is so significant is that in Revelation 19:1-2, when the Great Harlot City is destroyed, heaven rejoices and quotes directly from Deuteronomy 32:43! In other words, the destruction of Babylon, the city where the Lord was crucified, the city guilty of killing the prophets and the apostles and prophets of Jesus, is when the prophecy of Israel’s last days judgment, and the vindication of the martyrs would be fulfilled. Failure to honor this direct connection commonly results in a totally false identification of Babylon and a misapplication of Biblical eschatology. So, in the last days, at the Day of the Lord when He would arise to shake the earth, the Lord would purge the blood guilt of Jerusalem with the spirit of judgment and fire. Do not lose sight of what Jesus said would happen in his generation – the vindication of all the martyrs, all the blood of the righteous. How can one divorce Isaiah 2-4 from Jesus’ prediction? And more, since Revelation 6 quotes directly from Isaiah 2 to predict the Day of the Lord for the vindication of the martyrs, how is it possible to extrapolate the Great Day of the Lord’s Wrath in Revelation beyond Israel’s last days and beyond Jesus’ generation? “Then the Philistines gathered together to fight with Israel, thirty thousand chariots and six thousand horsemen, and people as the sand which is on the seashore in multitude. And they came up and encamped in Michmash, to the east of Beth Aven. When the men of Israel saw that they were in danger (for the people were distressed), then the people hid in caves, in thickets, in rocks, in holes, and in pits. And some of the Hebrews crossed over the Jordan to the land of Gad and Gilead” (1 Samuel 13:5-7). So, when the Philistines were about to invade Israel, the people fled to the hills, and hid in the rocks and the caves. “Then the children of Israel did evil in the sight of the Lord. So the Lord delivered them into the hand of Midian for seven years, 2 and the hand of Midian prevailed against Israel. Because of the Midianites, the children of Israel made for themselves the dens, the caves, and the strongholds which are in the mountains. 3 So it was, whenever Israel had sown, Midianites would come up; also Amalekites and the people of the East would come up against them” (Judges 6:1-3). Thus, just like in Samuel, the time of running to the hills and hiding in the rocks and caves was the language of warfare. And, it should be noted that these times of warfare were also the Days of the Lord! What this suggests, very powerfully, is that in Isaiah and Revelation, this common “vernacular” language of the Day of the Lord when men would run to the hills and hide in the caves, is not a reference or description of any imagined “end of time” coming of the Lord. After all, if the Day of the Lord is an earth burning, time ending event that is over “in a moment, in the twinkling of an eye” then it would hardly be possible to run to the hills and hide in the caves! Another thing to consider in light of John’s direct quotation from Isaiah 2 is that Jesus also quoted from those very same verses from Isaiah 2, in Luke 23:28-31. There, in what is almost universally admitted to be a prediction of the impending fall of Jerusalem, Jesus quoted from the very verses that John cites in Revelation 6. The question therefore is, since Jesus applied the prophecy of the Day of the Lord in Isaiah 2 to AD 70, then since John quoted from the very same verses that Jesus applied to AD 70, upon what grounds would we radically change Jesus’ application in Revelation to an end of time event? So, Isaiah 2 foretold the Day of the Lord when the Lord would “shake the earth” and vindicate the blood of the martyrs. Jesus cited Isaiah 2 to predict the vindication of his own suffering. Revelation cites that prophecy to speak of the coming Great Day of the Lord’s Wrath for the vindication of the martyrs. We thus have John predicting the Day of the Lord’s Wrath for the vindication of the martyrs, that Jesus said would occur in the judgment of Jerusalem. We have John citing Isaiah 2 and the very verses that Jesus applied to the coming judgment of Jerusalem. This means that the destruction of heaven and earth in Revelation 6 cannot be referent to an end of time destruction of literal, material creation. It means that the Great Day of the Lord’s Wrath in Revelation 6 can be nothing other than the AD 70 coming of the Lord in judgment of the blood guilt of Jerusalem and Israel. So, Revelation 6 is the Great Day of the Lord’s Wrath, which is to be conflated with Revelation 11, 16 and 20. The Great Day of the Lord’s Wrath in Revelation 6 is for the vindication of the martyrs and it is when the heaven and earth would be removed. The Great Day of the Lord’s Wrath in Revelation 11 is the time of the vindication of the slain prophets. The Day of the Lord’s Wrath in Revelation 16 is the time of the vindication of the prophets and saints when the heaven and earth flee away. And in Revelation 20 the earth and heaven flee away, which is indicative of the Lord’s Wrath. There is clearly no justification for divorcing Revelation 6 from chapter 11, 16 and 20. This means that there is but one Great Day of the Lord’s Wrath in Revelation. Thus, to identify Revelation 6 as the judgment of AD 70 means, definitively, and irrefutably, that the Great Day of the Lord’s Wrath, at the end of the Millennium, was in AD 70. As we proceed, this will become more than abundantly clear. Stay tuned! In the meantime, be sure to get a copy of my book, Who Is This Babylon? 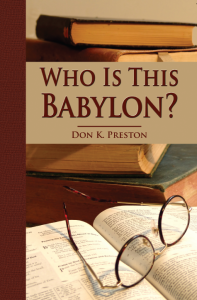 for a full discussion of the identity of Babylon as the great persecutor of God’s saints, and the object of the Great Day of the Lord’s Wrath that was coming very soon when John wrote that book. But, it should already be clear that to put the end of the millennium 2000 years removed from John’s day is totally misguided.